As Democratic Party delegates gather in Denver, America is repeatedly being told that we must transform our economy to “green” energy. Our future is in wind and solar, liberal Democrats and environmental activists insist. Oil, gas, coal and nuclear must go. American citizens vigorously disagree. They know fossil and nuclear fuels built this country and created health and living standards unprecedented in history. Over two-thirds support increased drilling. They know world energy demand is surging, while US production continues to fall. They realize anti-drilling policies don’t just cause unemployment and cost us billions in lost lease bonus, royalty and tax revenues. Those policies are an immoral war on poor families. They erode civil rights gains, and force minority and elderly households to choose between food, fuel and medicine. Since 2006, the cost of driving a 25-mpg car 10,000 miles has risen $600. Heating and air-conditioning costs – and the price of everything we eat, wear and do – continue to soar. While higher income families spend a nickel of every dollar on energy, families at the bottom of our economic scale spend up to half of their incomes on gasoline, heating and cooling. This is intolerable and unnecessary. We have centuries’ worth of oil, gas, oil shale, coal and uranium – and we can develop them without harming the environment. But environmental radicals in and out of Congress refuse to let us do so. They want to force us to switch to renewables, even though there is a yawning chasm between 0.5% of US energy produced by wind and solar power – and 93% produced with hydrocarbon and nuclear power. The eventual switch to alternative energy is obviously decades away. Meanwhile, we are sending nearly $700 billion a year to oil-rich oligarchs, while actions by Russia, Iran and Venezuela underscore our own and Europe’s national security vulnerability. People are angry that House Speaker Nancy Pelosi refuses to allow a debate or vote on ending congressional drilling bans. The only “energy” bills she supports would open few areas, while adding more taxes, regulations, lawsuits, delays, price hikes, and renewable-energy mandates and subsidies. They will produce little or no new energy. 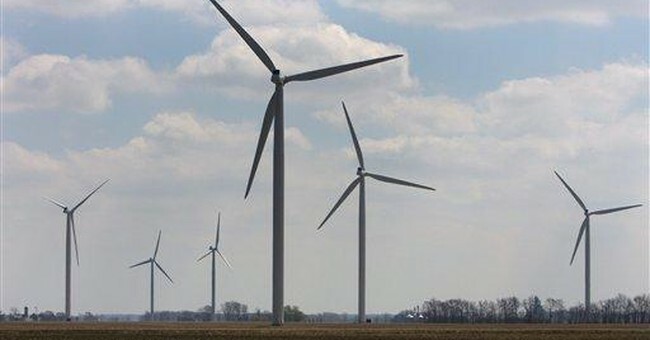 Wind farms with hundreds of gargantuan, unreliable turbines have to be located where the wind actually blows, usually hundreds of miles from cities. That means long transmission lines, often through forests and scenic areas. And that means opposition, delays and lawsuits from the same environmentalists who “support” wind and oppose power plants that actually produce abundant, reliable, affordable energy. As the Wall Street Journal notes, greens are already blocking transmission lines in a dozen states – even one for a wind-solar-geothermal complex. It’s increasingly obvious that the only power environmentalist pressure groups and their congressional allies want is the power to control our lives, and curtail our energy use and economic growth. Their latest ploy involves claims that the greatest threat facing minority families is climate change. Not drugs, teen pregnancy, deadbeat fathers, gangs, murders, frightening dropout rates, AIDS or skyrocketing energy and food prices. Climate change. “Our very health and economic well-being are at stake,” claims the president of the Joint Center for Political and Economic Studies. The Center has teamed up with the Natural Resource Defense Council and other extreme environmental groups to convince minorities that “costly” global warming will have “disproportionate impacts” on minorities. Temperatures are higher in cities, they argue, due to the “urban heat island effect” – and air-conditioning use among black families is half the rate for white Americans. Therefore, global warming will cause more heat-related deaths among minority families, they claim. This attempt to justify anti-energy policies by promoting climate change hysteria is embarrassing nonsense. The disparity in heat-related deaths has nothing to do with climate change, and everything to do with the inability of poor families to afford air-conditioning and electricity. The disparity in cold-related deaths is even more striking, and likewise due to energy affordability. Lock up our energy, take away fossil fuel and nuclear power, impose cap-and-trade policies – and you drive prices even higher. You make heat and electricity less affordable. You force more people to depend on unreliable, nonexistent wind power. You force more to choose between heating and eating. You cause more to die. But radical greens want to reduce access to the fuels that produce 93% of our energy. They want to increase energy costs. They call this “energy conservation.” I call it “economic enslavement” – and worse. Moreover, global temperatures have barely risen for 10 years, even as global CO2 levels soared. Many experts say we are heading for a period of falling temperatures, because of declining solar intensity. Over 31,000 scientists say there is no credible evidence that carbon dioxide emissions cause climate change, much less global warming disasters. And China and India are not about to end their fossil fuel use. Punishing poor families in the name of speculative climate chaos is insane. We need to bring sanity and compassion back to our energy policies. Drill, mine and use American energy. And demand that Speaker Pelosi and Senator Harry Reid end their war on poor families, and have a real debate and vote on our energy and economic future.